Welcome to day 2 of my endeavors into futuristic nail art! Today I have drawn my inspiration from a video game called No Man's Sky. Have I played it... Nope. However I have seen it on our TV many times and it has some pretty great colors in it, cool details and fun weird words! 😉😆😅 So lets get a closer look! So No Man's Sky is a game that takes place on various different planets that don't even exist to our knowledge which is fun and totally makes it futuristic right? Here I kind of have the landscape that you see in many ads for the game as well as possibly the box I think? Not sure on that but HERE is the image I based it off of. 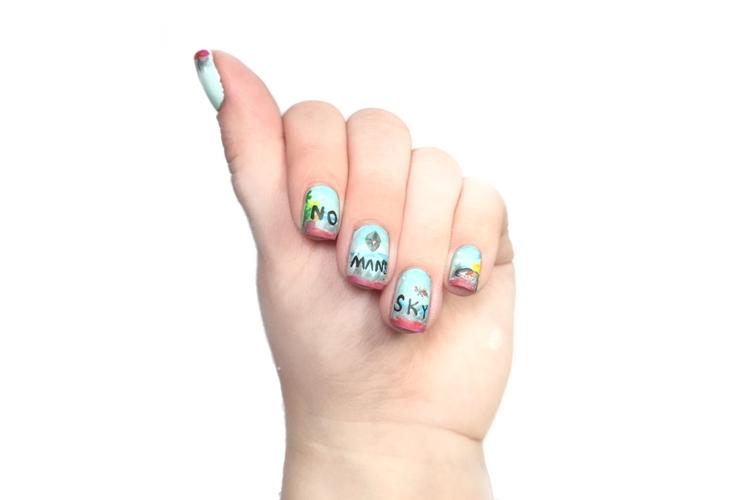 You get a moon on the "Man's" nail as well as the well known logo for the game, then on the index finger you have two moons! Craziness! Then of course there are some "space ships" I'm using that term loosely because they may have a different name in the game. Its quite an interesting game, plus it reminds of Christmas Break last year! It was fun to create actually and even though its not a perfect match to the game cover it got the approval from my brothers who play it! 😀 So thats enough for me! Well that is it, such a fun mani to do actually and now I just want to go see everyone else Day 2 nails! Hope you are having a great day and I will see you tomorrow! So cute! Video games would have been a great inspiration - so many take place on other planets. :) I love it! Right! Thankfully I have connections to people in the game world so I could pick their brains! Haha! I've never heard of this game but this is such a cute mani, I don't care! Haha! I don't play it but the colors are great in it! I don't know this game but I can see from this nail art it is the perfect idea for futuristic! Great job! Thank you! Yeah I have never played it but the colors and names in it are neat! Yay, thank you! Its a tricky one! Making me think for sure! I've never heard of this game but your artwork is really cool! Its a neat one to watch, I don't play ha! Thank you so much! I don't play video games so I have no idea what's out there besides FIFA and Grand Theft Auto. But this is a cool mani. Thank you! Hehe, yeah I don't play it! I'm more of the Mario Party, occasionally a racing game or snowboarding! Lol, super selective! Your freehand work is outstanding! Thank you so much! This was actually so much fun! I love No Man's Sky! It's so beautiful and unique! Thank you so much! Its such a pretty game to watch others play!